Note: Outage data reflect only nuclear units that have operated or were intended to operate in the past year. As the country reaches the summer peak electricity demand season, nearly all U.S. nuclear generators have returned from refueling outages. Total outages were less than 1.5 gigawatts (GW) on July 6, the lowest level since late January. 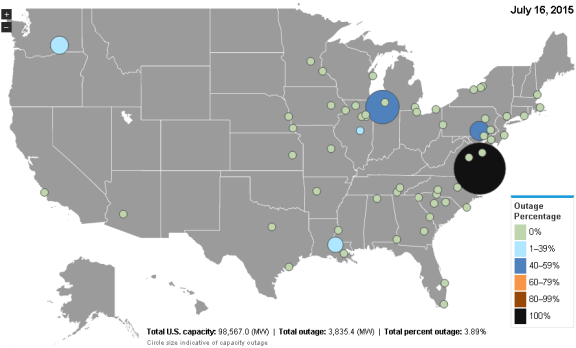 Daily nuclear outage levels and plant-by-plant status updates can be found in EIA's new Status of U.S. Nuclear Outages page. This analysis tool draws from data gathered by the EIA-860 and 860M surveys, as well as the Nuclear Regulatory Commission's Power Reactor Status Report. 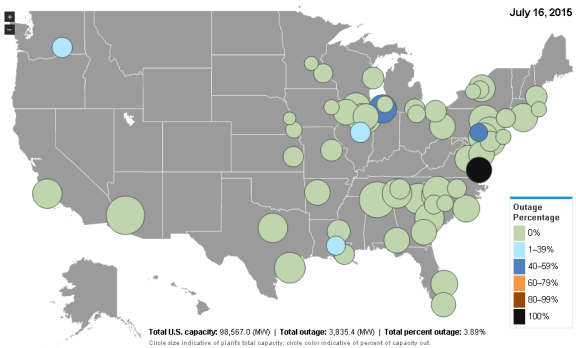 The page includes two maps showing the capacity and outage status of U.S. nuclear plants. Nuclear power reactors are typically refueled every 18 to 24 months. Although the refueling process can be completed in as few as 10 days, outage periods are typically longer because of noncritical maintenance that is completed concurrently with refueling to minimize downtime over the course of the year. Nuclear generators provide a large, baseload source of electricity and typically operate at maximum capacity around the clock. Nuclear plant operators generally plan refueling outages to occur during the fall and spring months when demand for electricity is usually at its lowest because of modest cooling or heating needs. Outage levels have been below the previous five-year range (2010-14) for much of this year and consistently lower than last year.